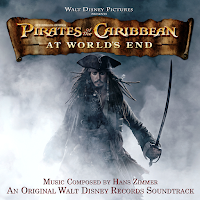 Arranjo da música "Drink Up Me Hearties" de Hans Zimmer, da trilha sonora de Pirates of the Caribbean: At World's End (Piratas do Caribe: No Fim do Mundo) para orquestra. "Drink Up Me Hearties is a musical theme composed and conducted by Hans Zimmer for Pirates of the Caribbean: At World's End. It appears as track thirteen on the film's soundtrack, at 4:31 in length. The track begins with an off-kilter, harpsichord version of Jack Sparrow's introductory theme from "The Medallion Calls", and also includes a rendition of the love theme from Pirates of the Caribbean: The Curse of the Black Pearl (00:35). "Jack Sparrow" is heard (00:51), before Jack's first theme returns in its full glory (01:04), which segues into a triumphant rendition of "He's a Pirate" (01:19), including the segue used to transfer to "Jack Sparrow" in the Pirates of the Caribbean: Dead Man's Chest credits. Here, "He's a Pirate" leads into the full version of the love theme first heard in "At Wit's End" (02:20). This track accompanies the final scenes of the film, and segues directly into the credits. The track takes its name from a line in "Yo Ho (A Pirate's Life for Me)" ("Drink up me hearties, yo ho! "), which is also Jack Sparrow's final line in Pirates of the Caribbean: The Curse of the Black Pearl and Pirates of the Caribbean: At World's End."